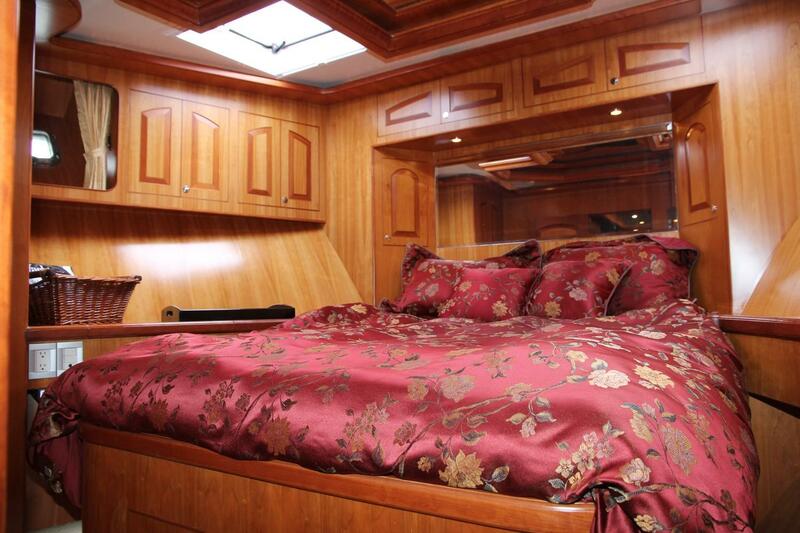 Folie Deux is a striking yacht. 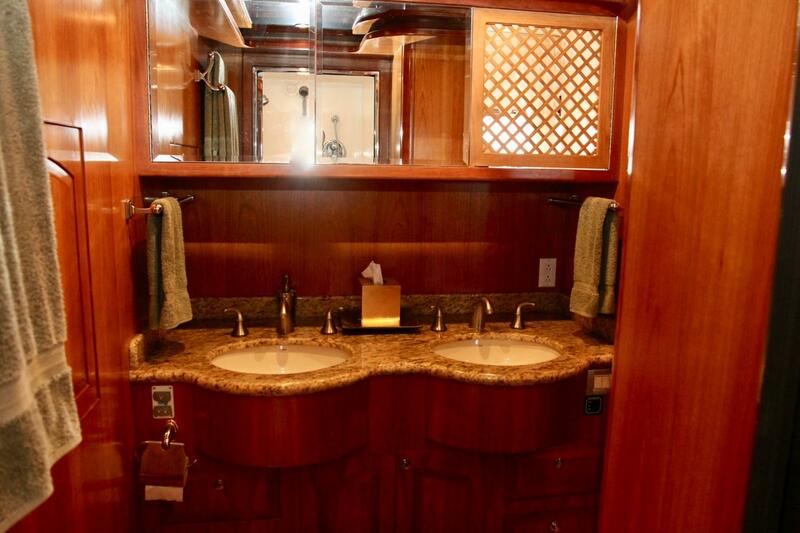 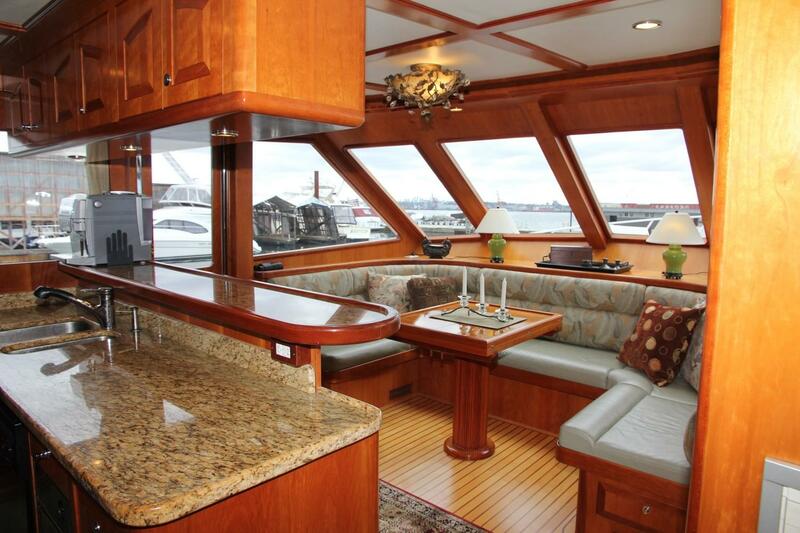 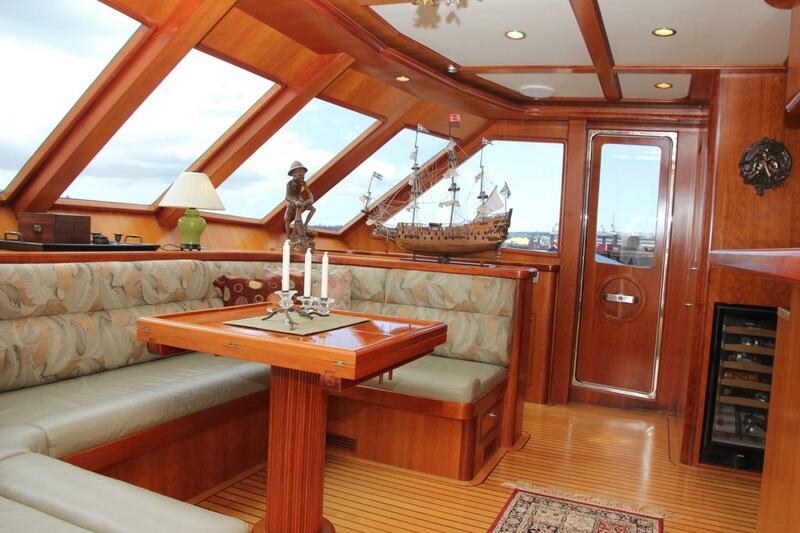 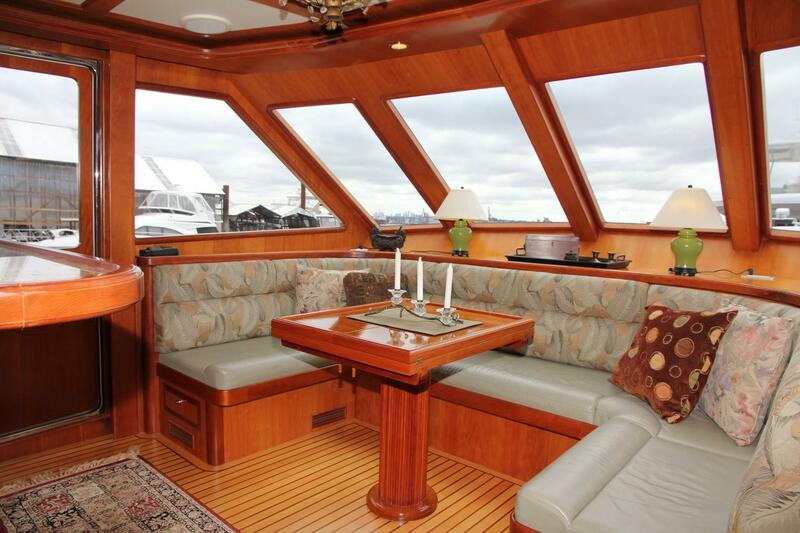 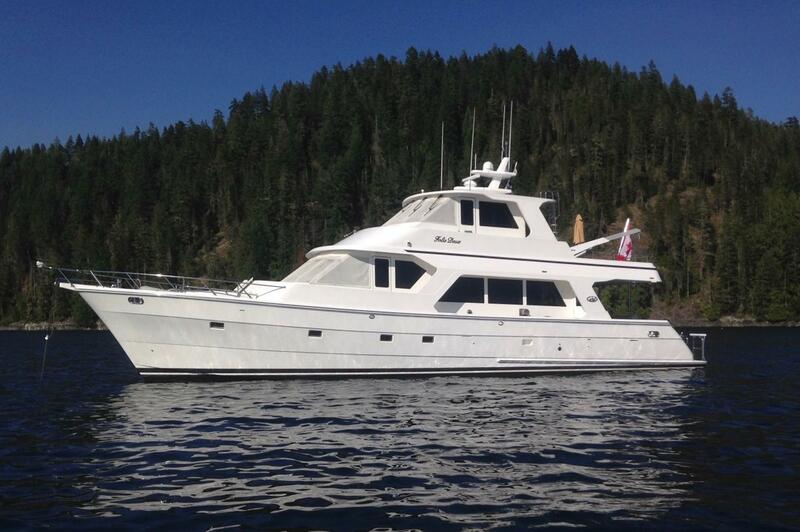 The President Legend 700 Pilothouse Skylounge is spacious, elegant at every turn, well optioned, and well maintained. 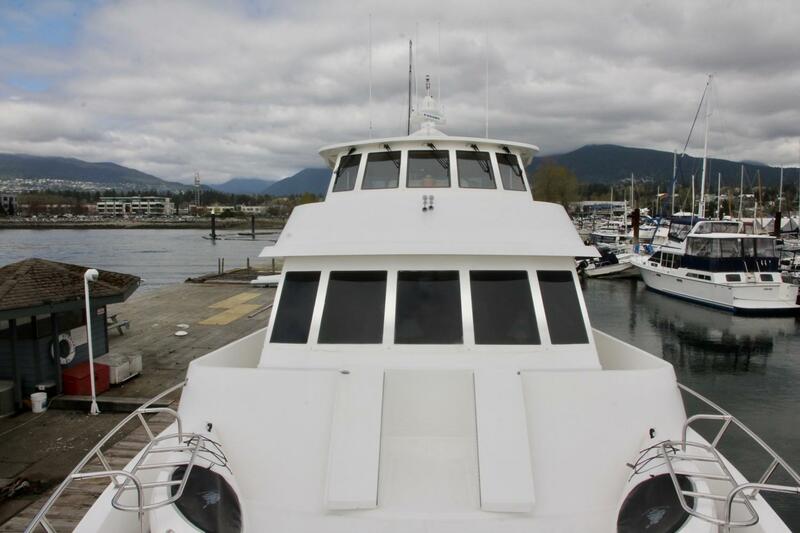 She stands ready for comfortable year round cruising. 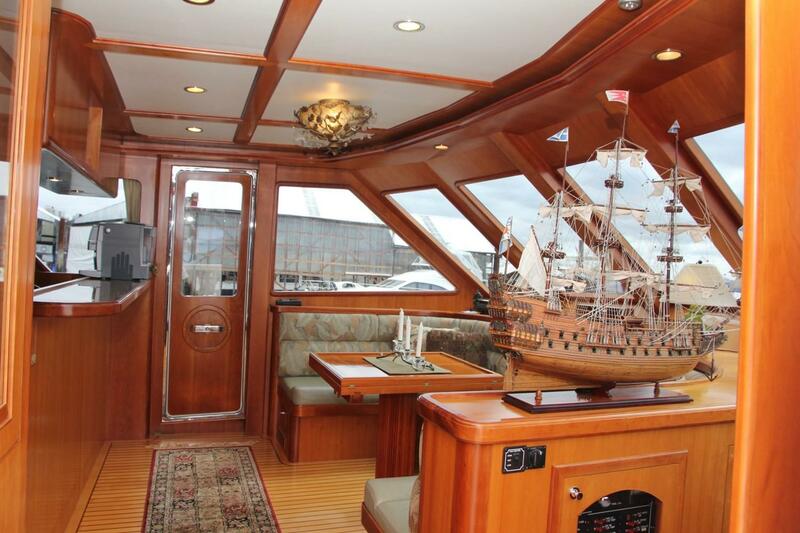 This is a high quality yacht with distinctive, handsome lines, accentuated by a Portuguese bridge on the main deck and on the Skylounge deck. 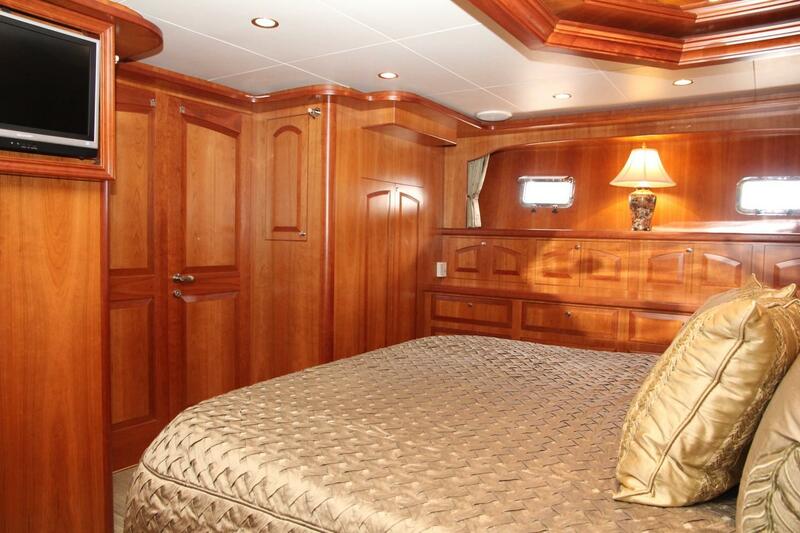 The interior finish is superb with exceptional attention to detail. 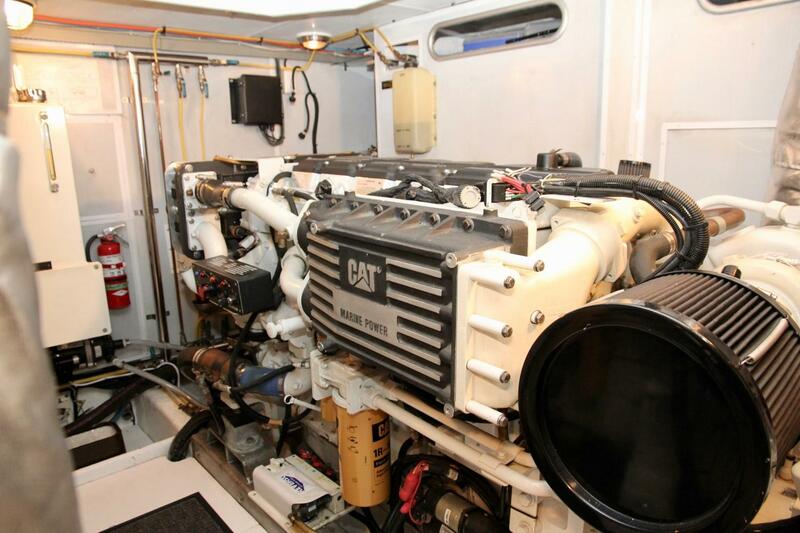 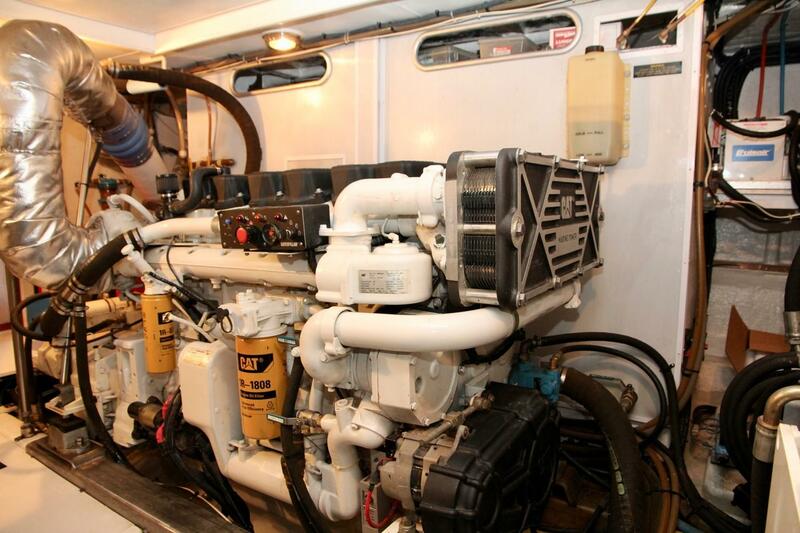 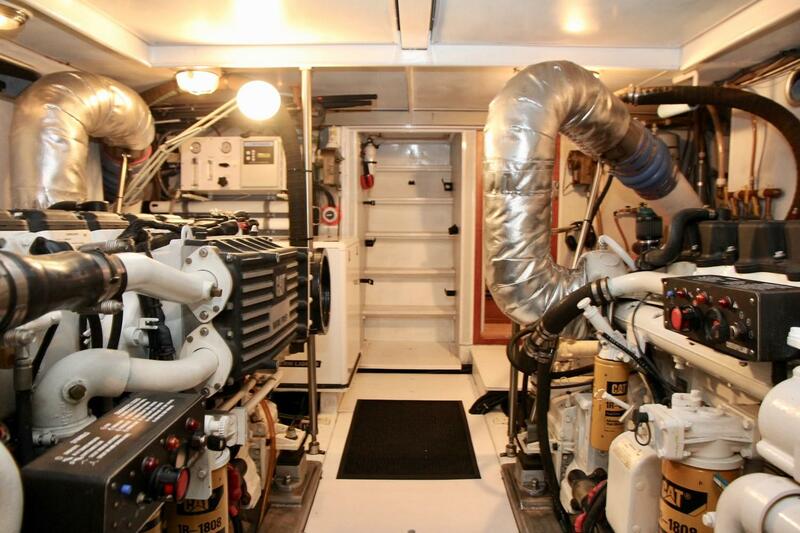 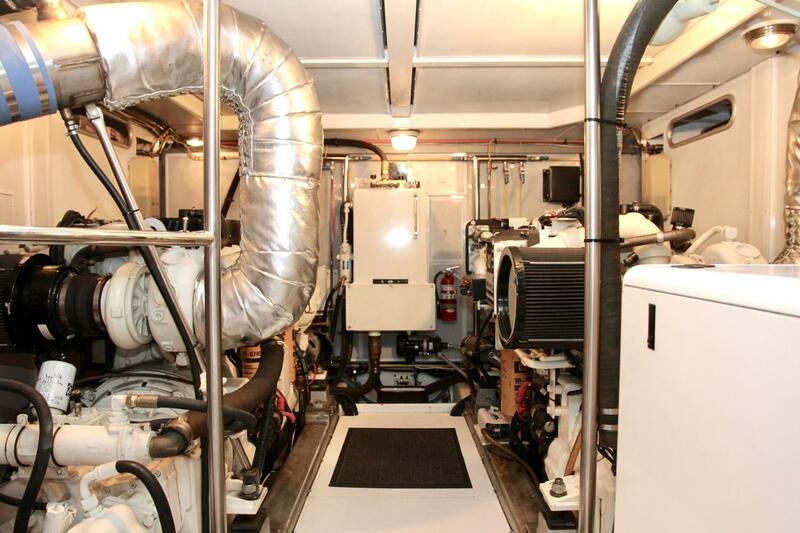 Powered by twin 800 hp Cats for reliable and economical cruising at 16 knots. 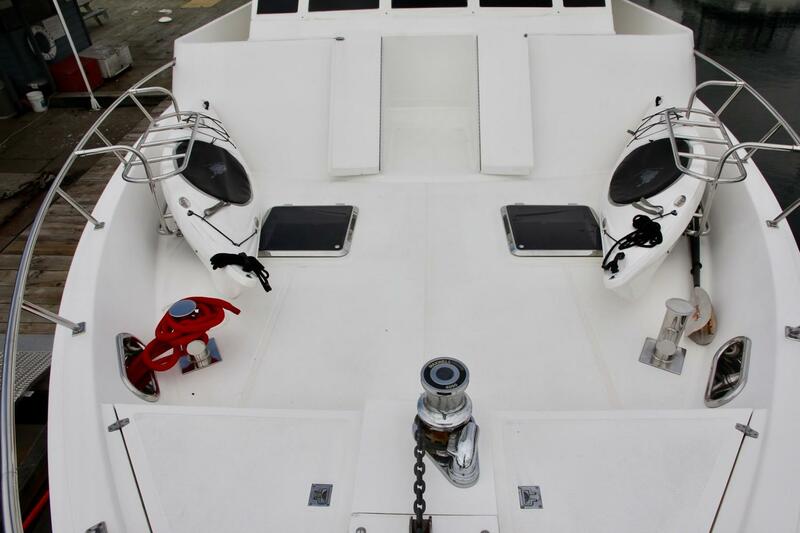 Wesmar stabilizers and Wesmar bow and stern thrusters ensure guest comfort in a sea way, and operator comfort in a tight marina. 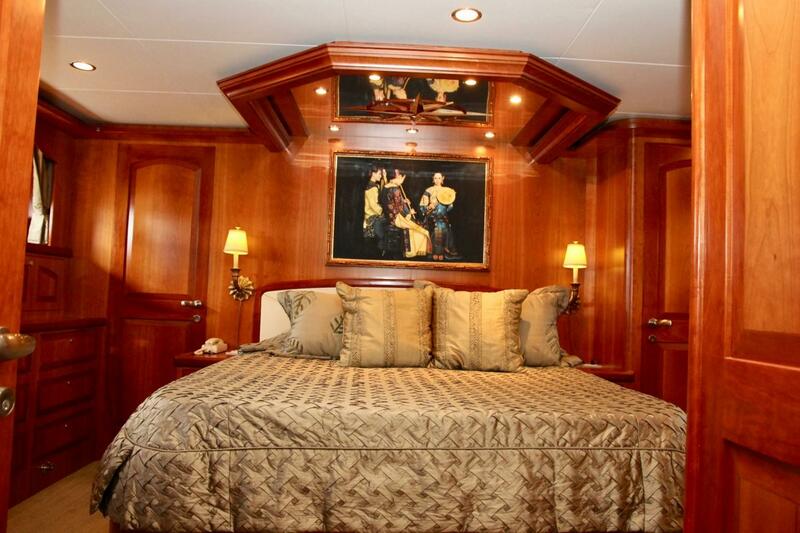 Three generous staterooms, an office, and crew quarters that can easily stand as a comfortable fourth stateroom. 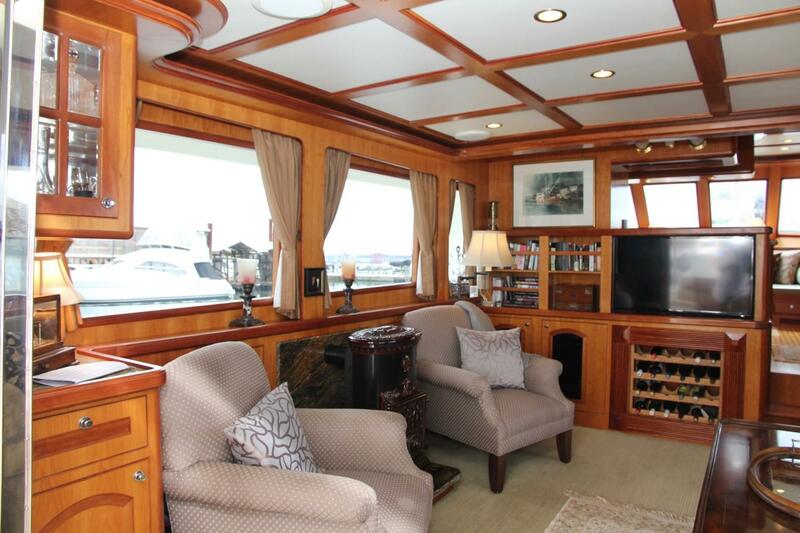 Enjoy year round cruising in warmth and comfort with the Kabola diesel furnace hydronic heating system, the unique salon fireplace, a beautiful French parlour stove, and the reverse cycle air conditioning. 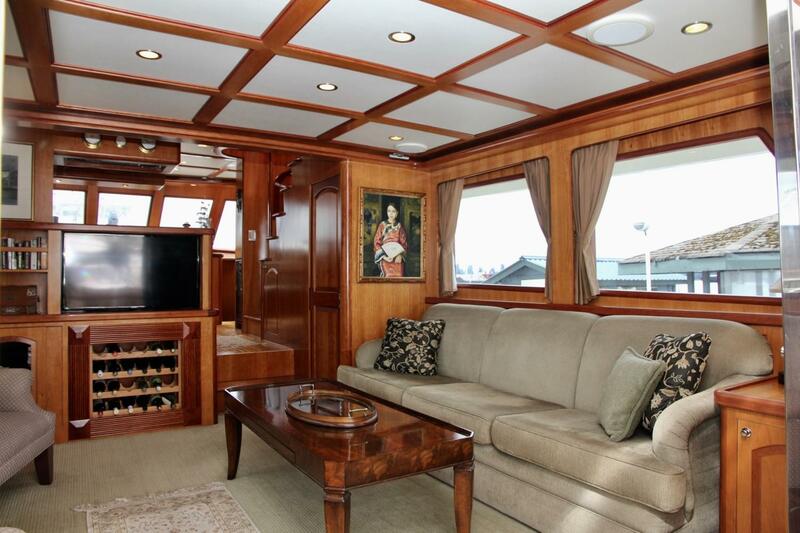 Folie Deux has been maintained to a very high standard since new, and is now is being offered by her second owners. 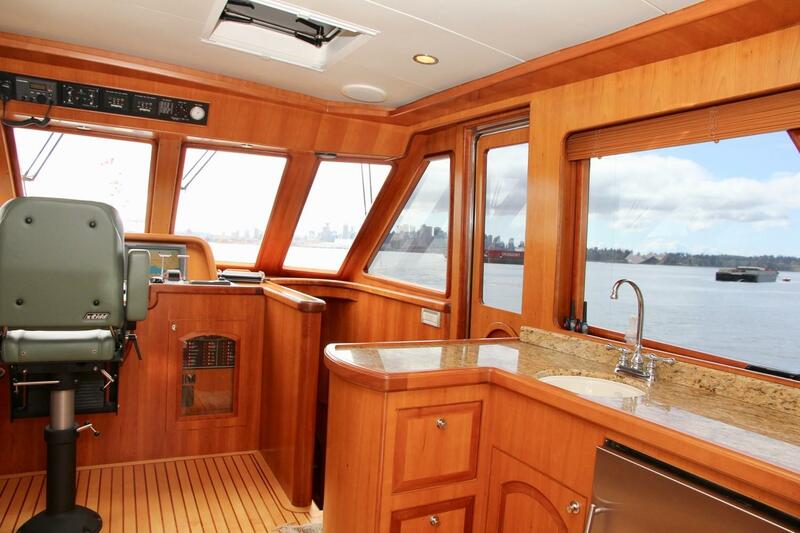 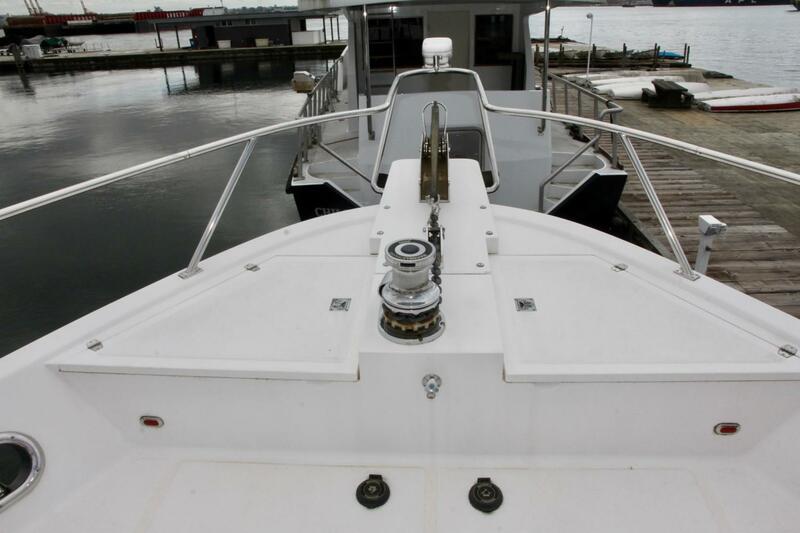 She is new to the market and is truly a must see vessel. 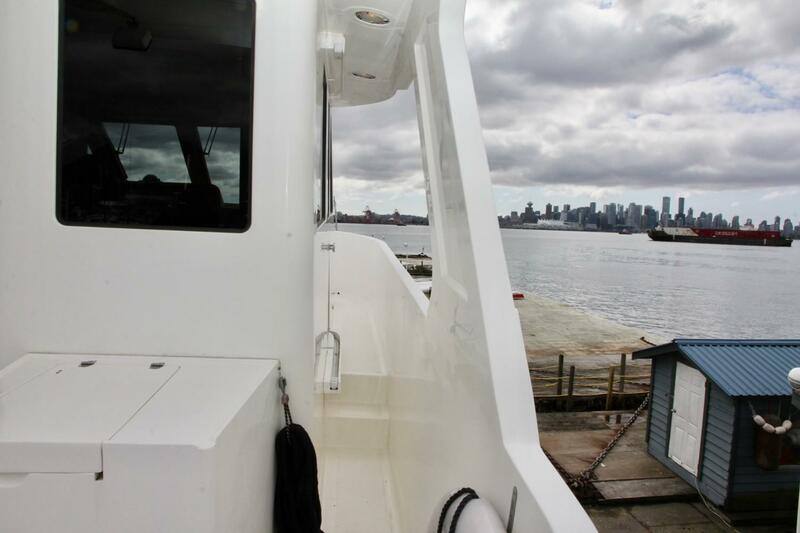 Canadian duty has been paid. 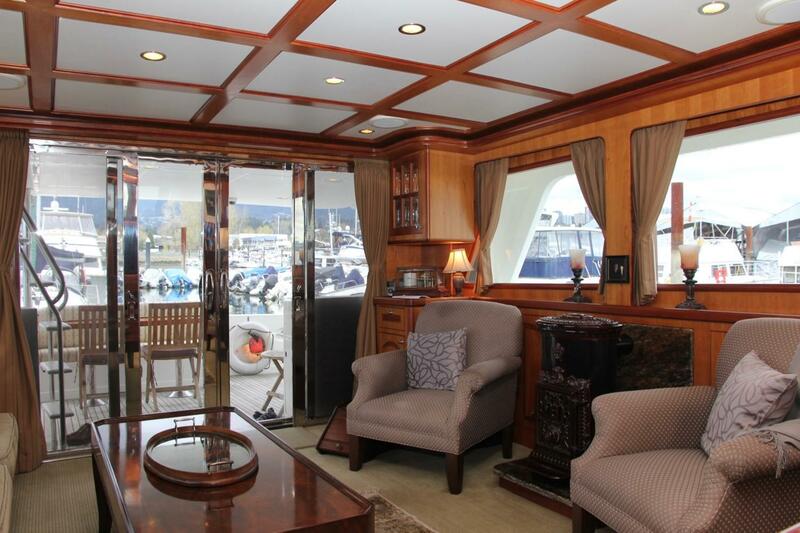 From the cockpit, enter via double stainless steel doors to the salon, a warm, welcoming, space with luxurious finishing. 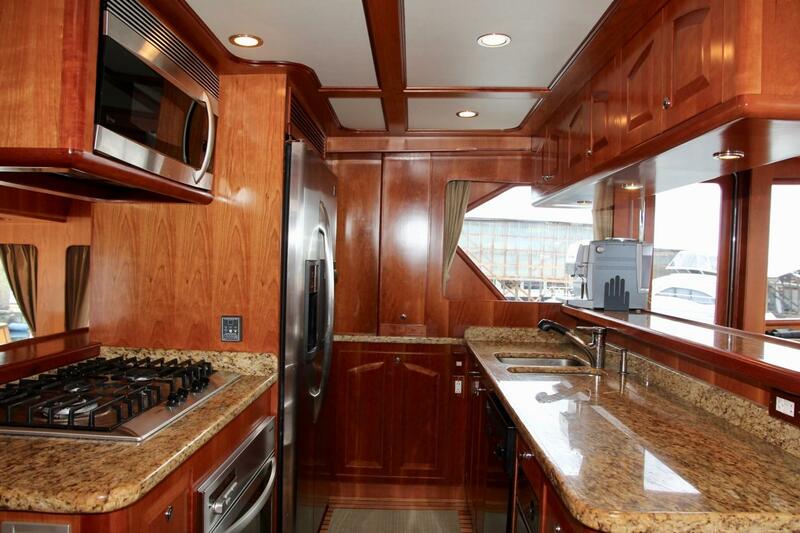 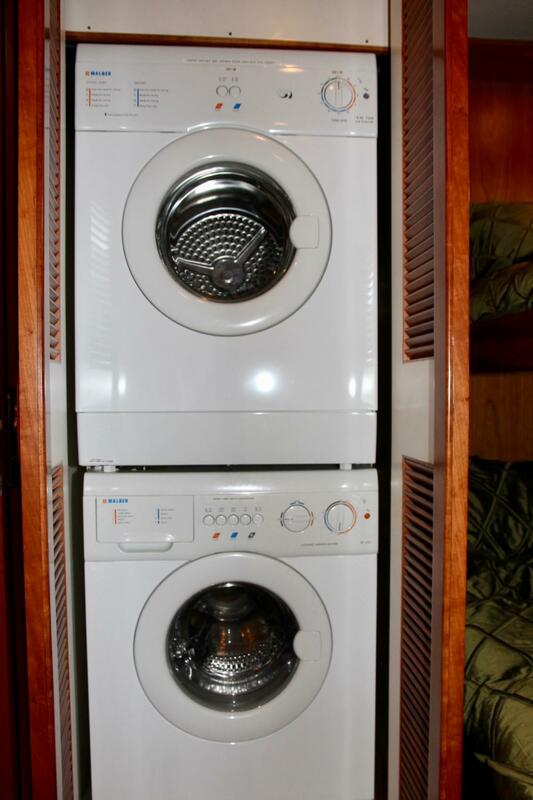 Up a couple of steps, the salon gives way to the galley, forward and to port, with full size appliances. 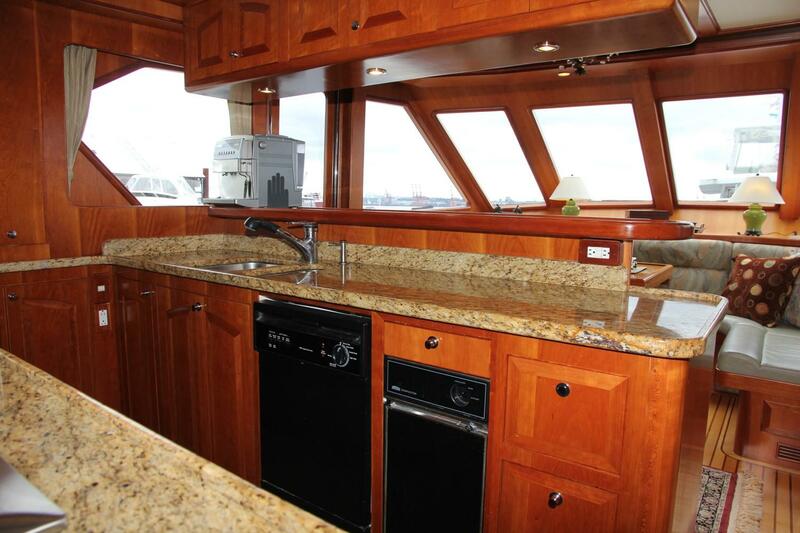 The dining area is in the country kitchen forward of the galley, with port and starboard doors to the side decks. 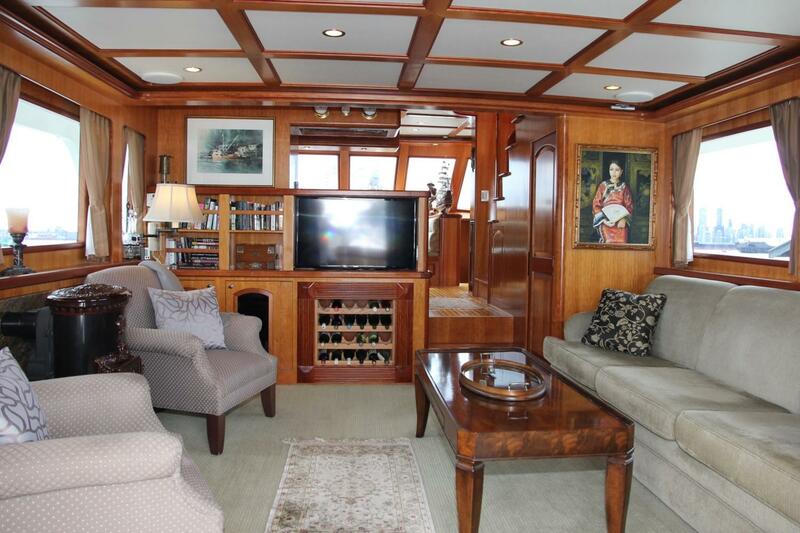 Also on this main deck, there is a handy guest / day head midships to starboard. 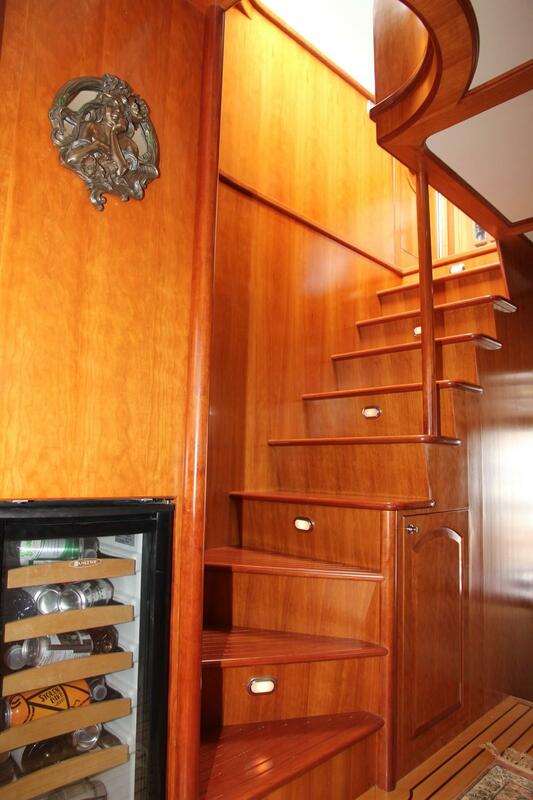 Forward and to starboard, a gently sloped staircase descends to the accommodation area with a broad foyer giving way to three staterooms and two heads. 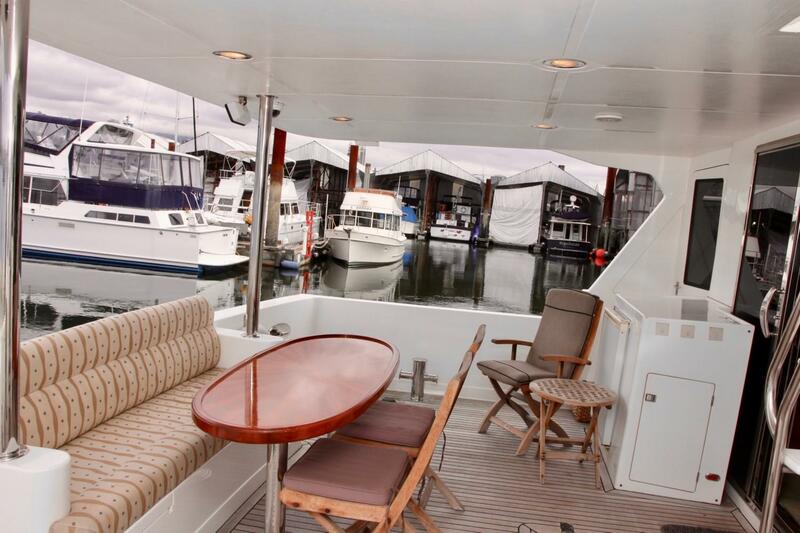 Or up, just ahead of the day head to the skylounge deck with lounge area, helm station, wet bar, and access to the upper side decks and aft boat deck. 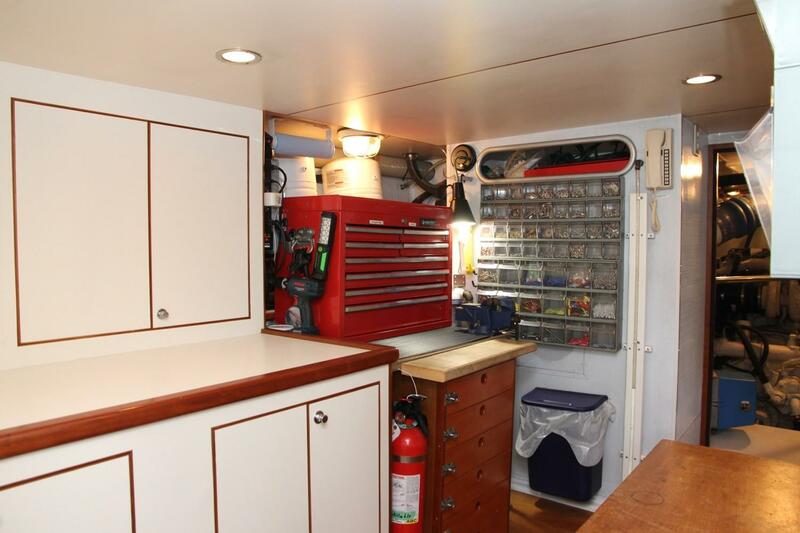 Aft are crew quarters with another head, a useful workspace / utility room, and entrance to the engine room. 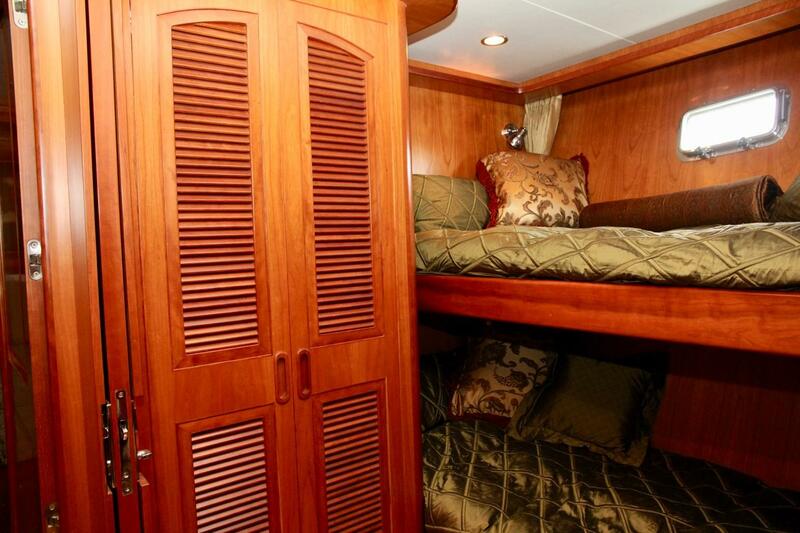 Accommodations are in three staterooms plus a crew’s cabin aft. 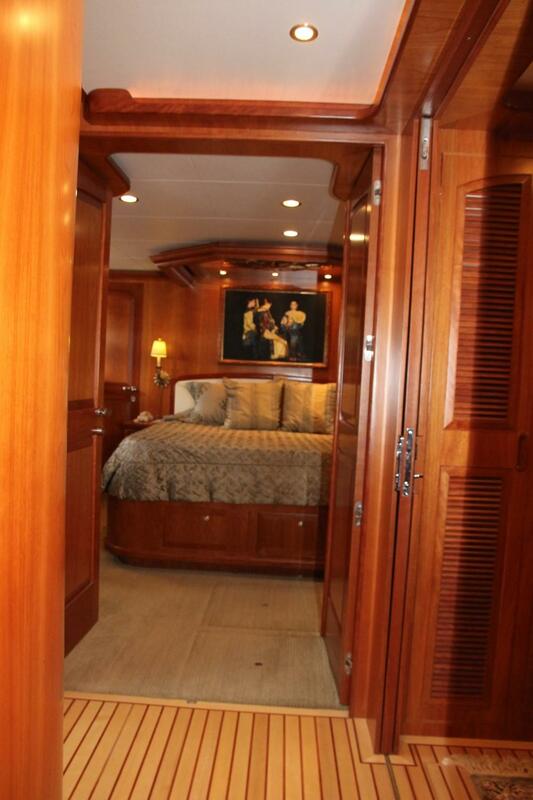 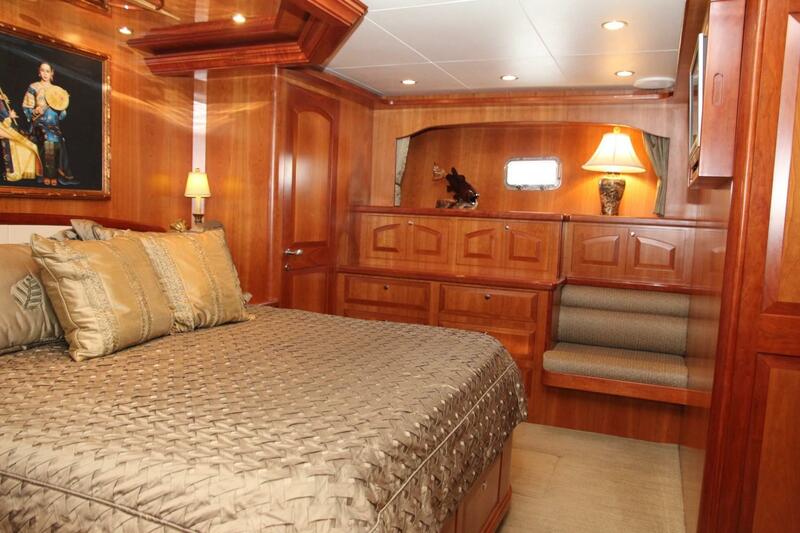 From the accommodations foyer, double cherry finished doors open to the master stateroom. 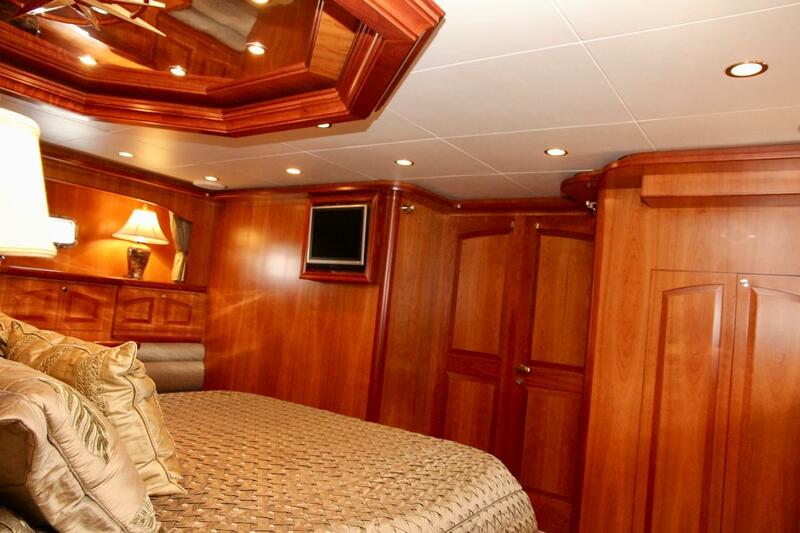 It is located midships and takes advantage of the full beam, with a walk-around king size bed, side tables, and a settee lounge. 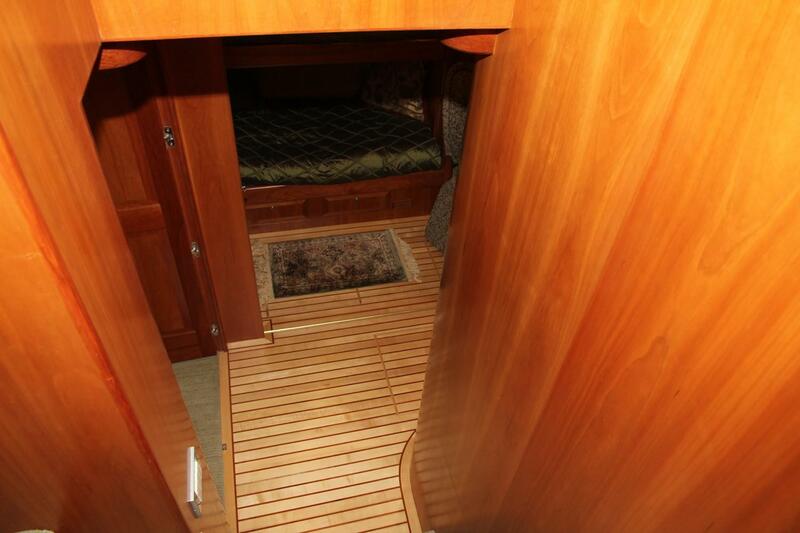 And room for all personal belongings needed for an extended summer on board. 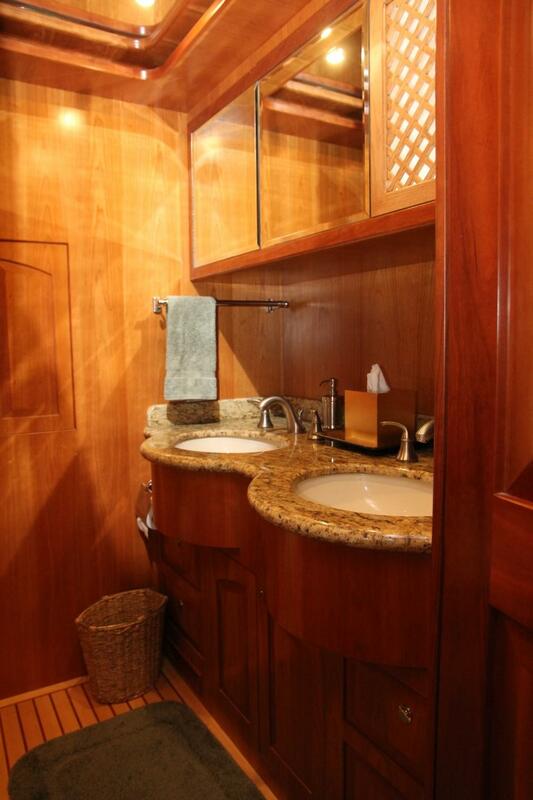 The master ensuite head has dual sinks with Kohler faucets, granite counter top, quiet flush toilet. 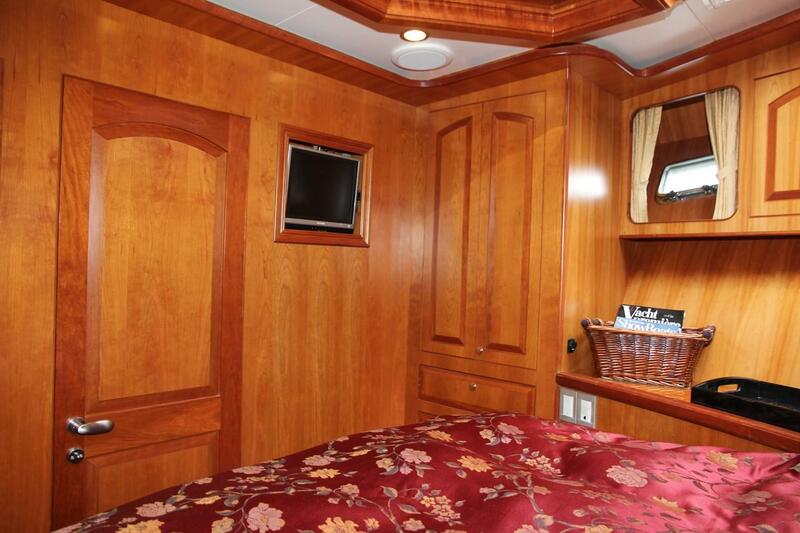 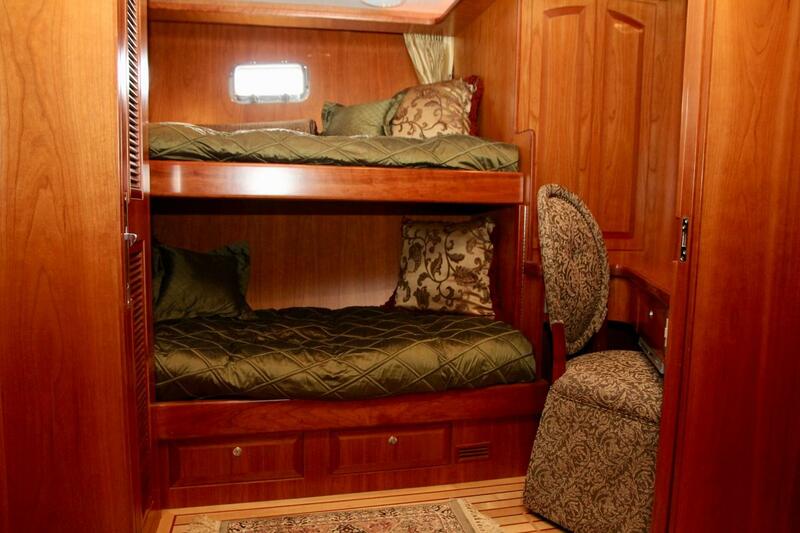 Forward is the VIP guest stateroom with an island queen berth, and great storage in two hanging lockers, and 14 other drawers and cabinets. 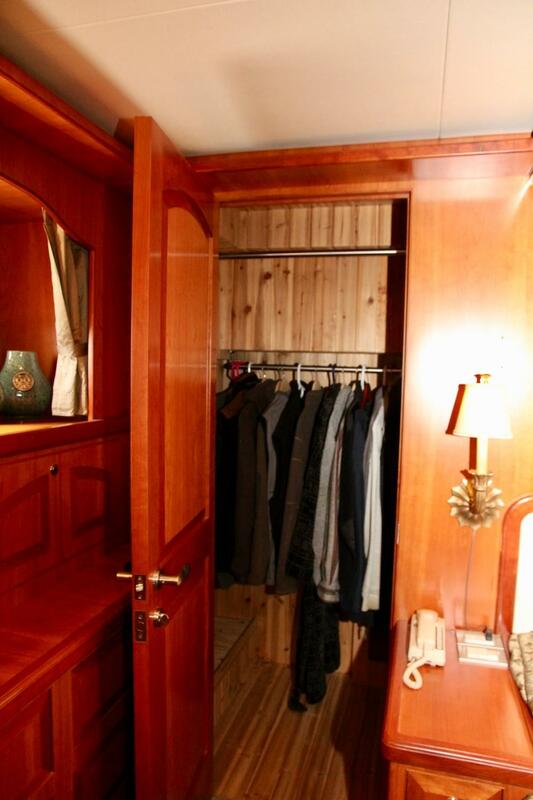 The guest cabin is to port at the base of the accommodations stairwell, and is accessed via a sliding double pocket door. 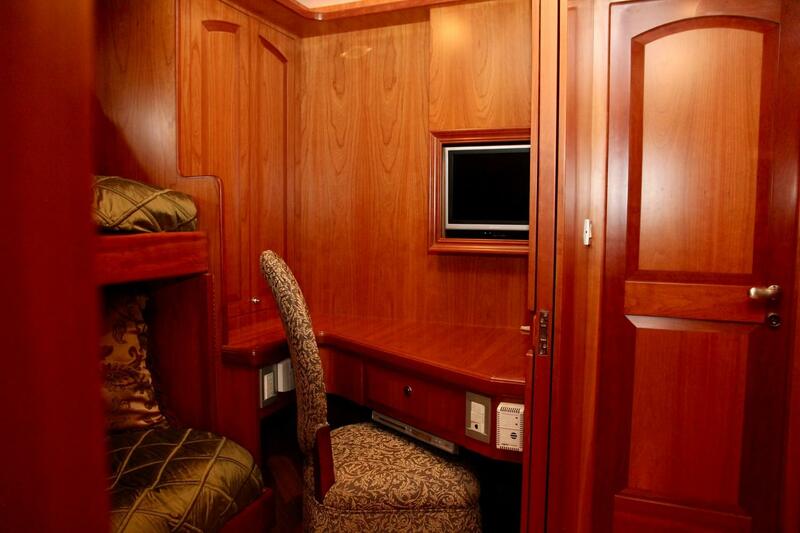 It is designed to be used as an office space or a private stateroom as needed. 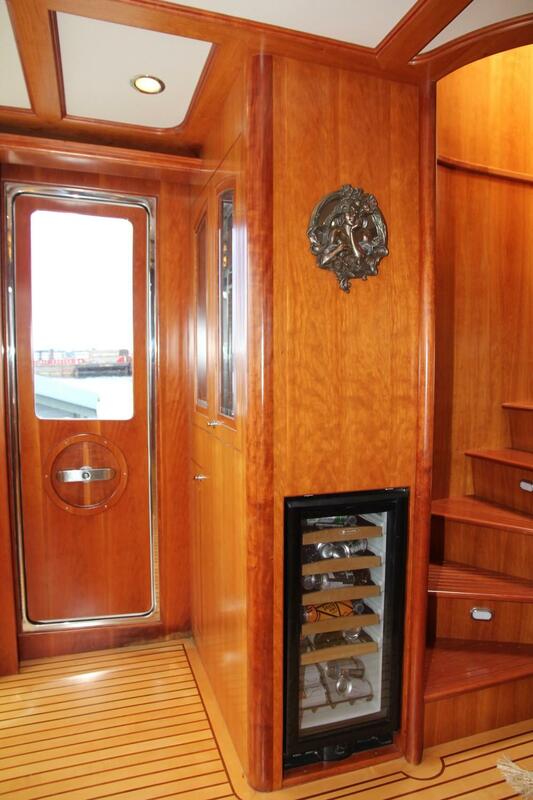 Located in the main foyer opposite the port cabin / office, with direct access from the VIP cabin forward. 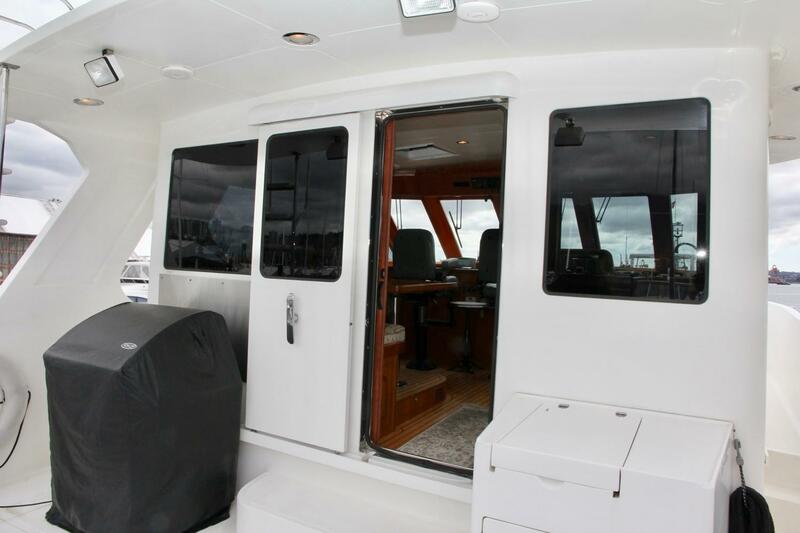 From the cockpit to the salon, awash in natural light, there are four panels of floor-to-ceiling glass, framed in polished stainless steel. 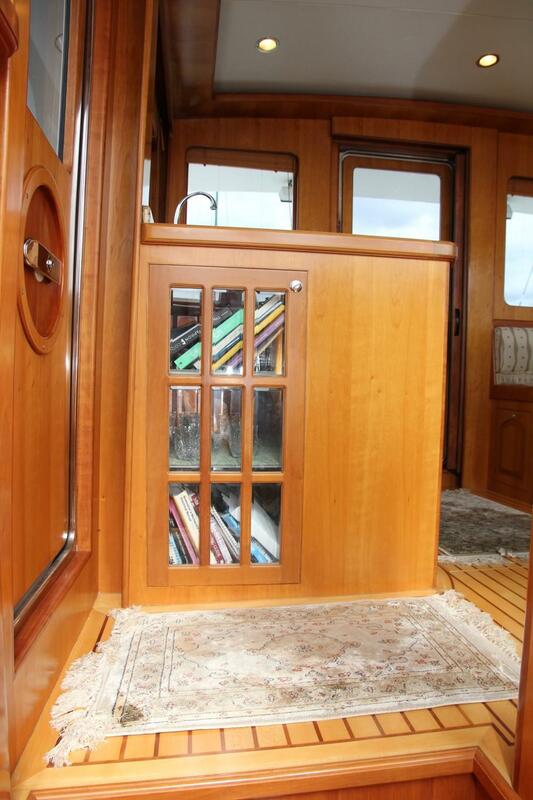 Two of these panels are the sliding glass entry doors. 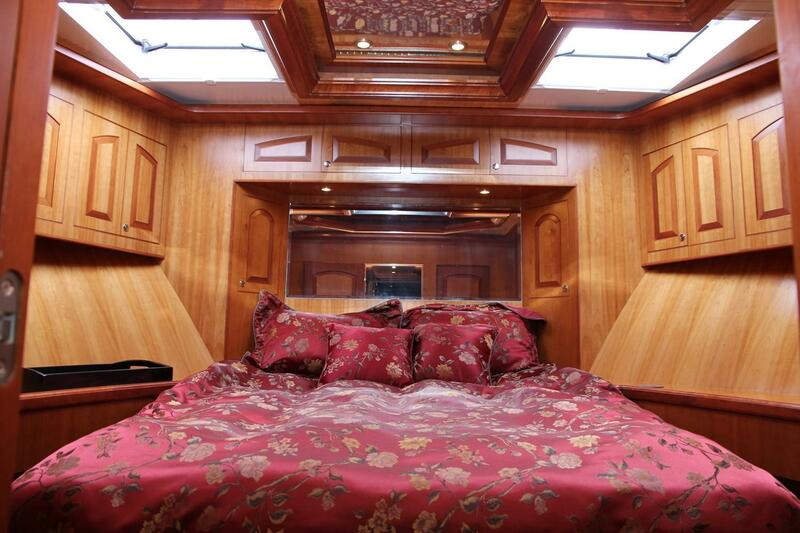 Custom interior decor includes a distinctive dropped ceiling design with indirect lighting. 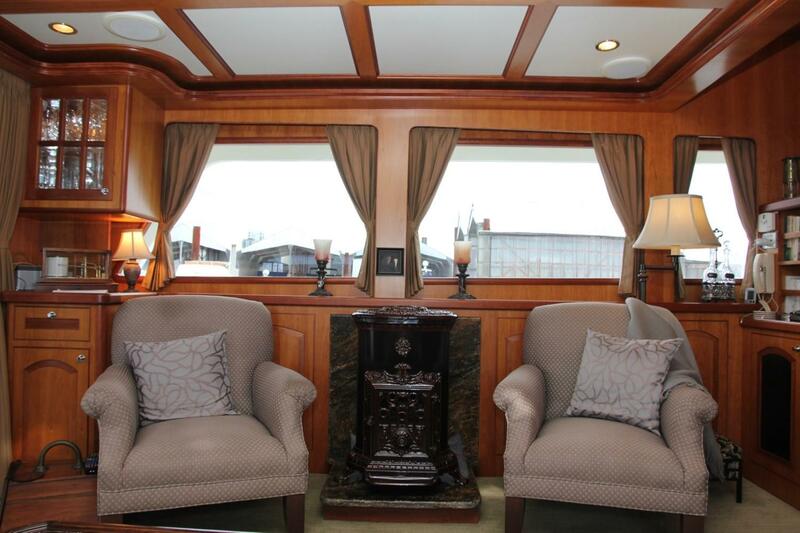 To starboard is a plush sofa and coffee table and to port are two high-quality occasional chairs with a distinctive French parlour stove for ambience and heat. 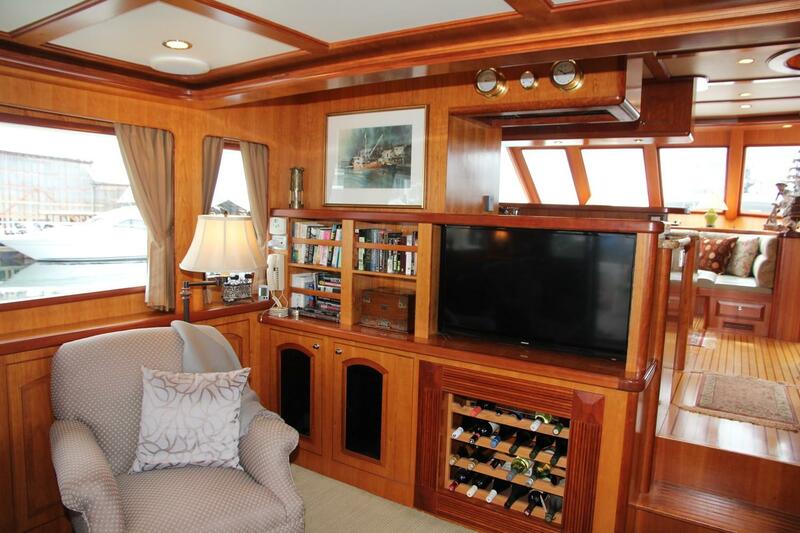 Forward are more cherry cabinetry, a wine rack, and the entertainment centre. 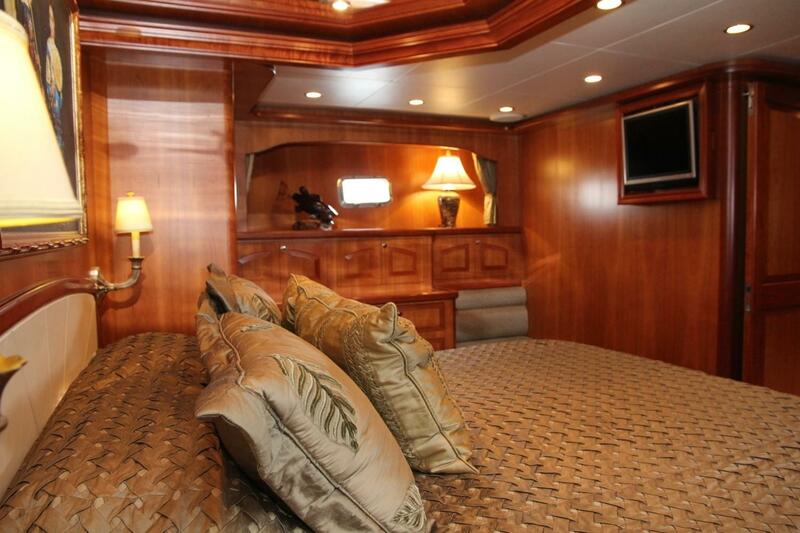 Up two steps and to starboard is the day / guest head, an enviable and sought-after option rarely found is such designs. 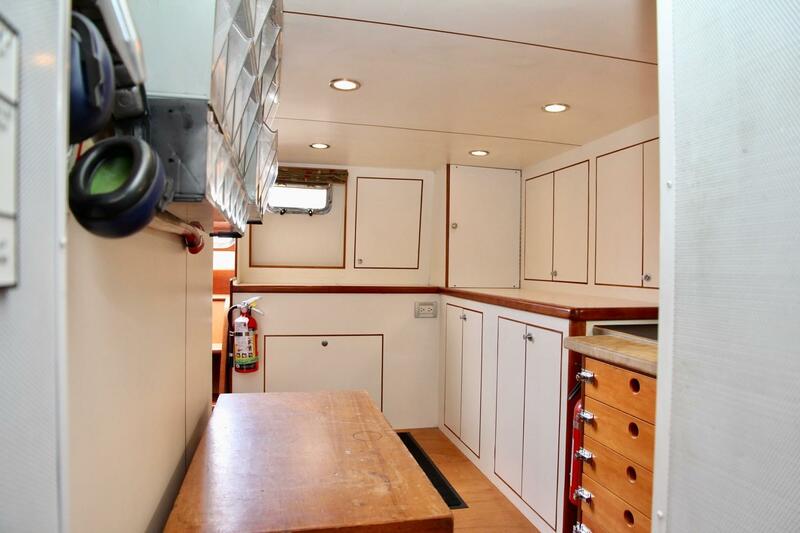 The spacious Country Kitchen forward is an open and airy design. 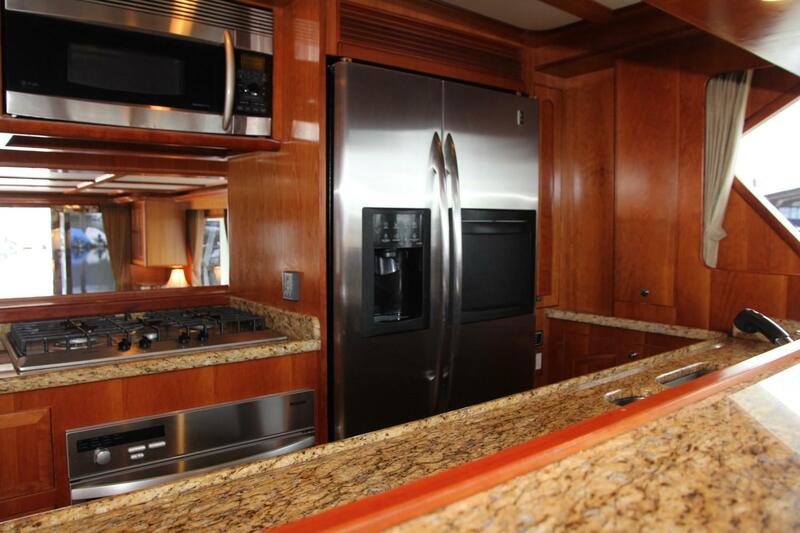 With granite countertops, beautiful cabinetry, and all the right cooking equipment, the U-shaped galley's layout offers the chef plenty of space to prepare afternoon snacks or gourmet meals. 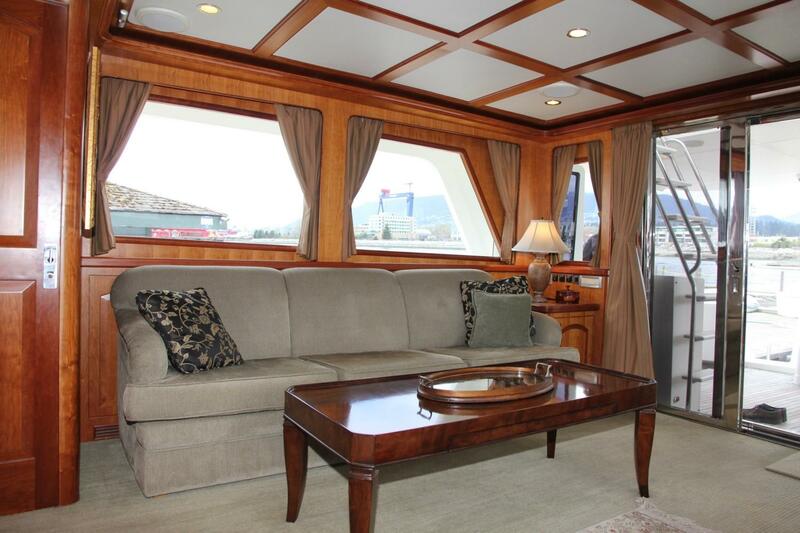 Just forward is a full beam comfortable cruising settee / dining area, port and starboard aircraft style doors to access the walk-around protected side decks. 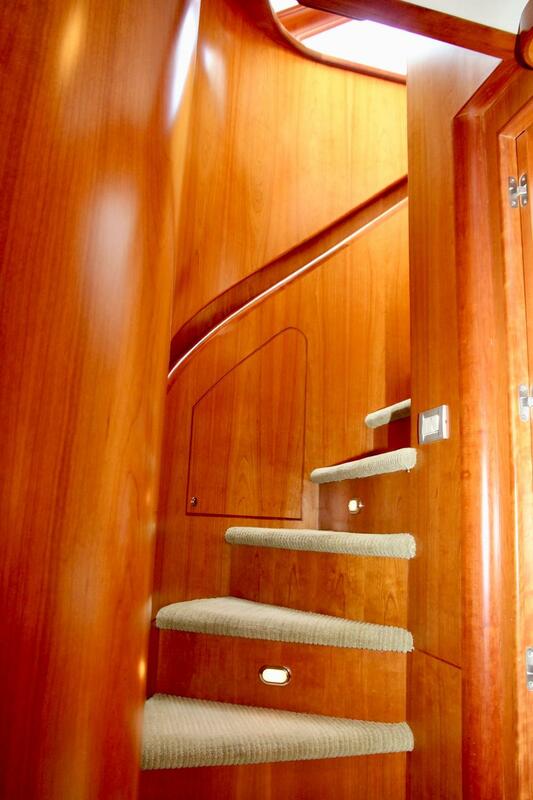 Up a staircase from Folie Deux’s main deck to the skylounge with helm station and comfortable lounge area. 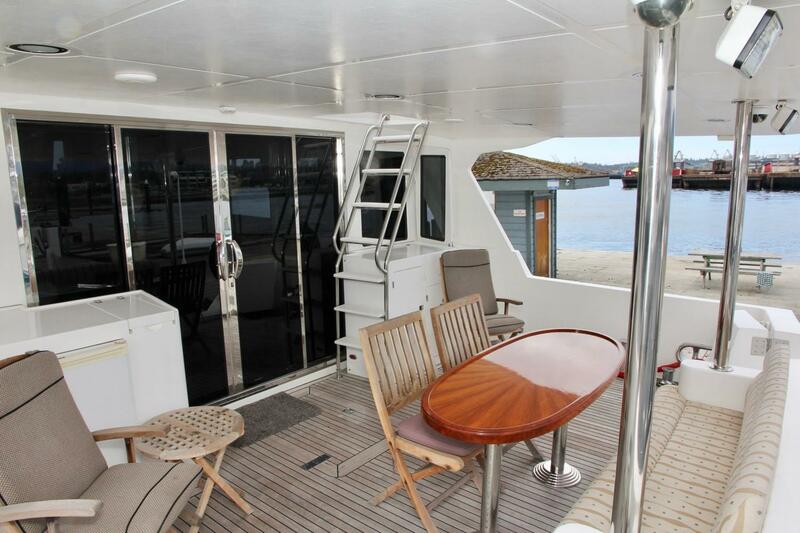 The enclosed skylounge is a fabulous space and provides owners and guests with another area superb for entertaining or quiet relaxing. 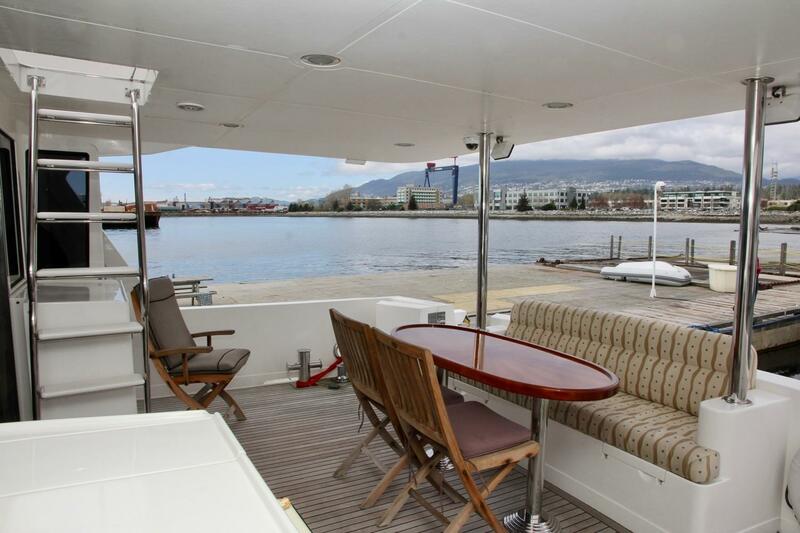 Equally functional as a comfortable siting area for guests to join the operator during a passage, or a dining and entertaining space with broad vistas. 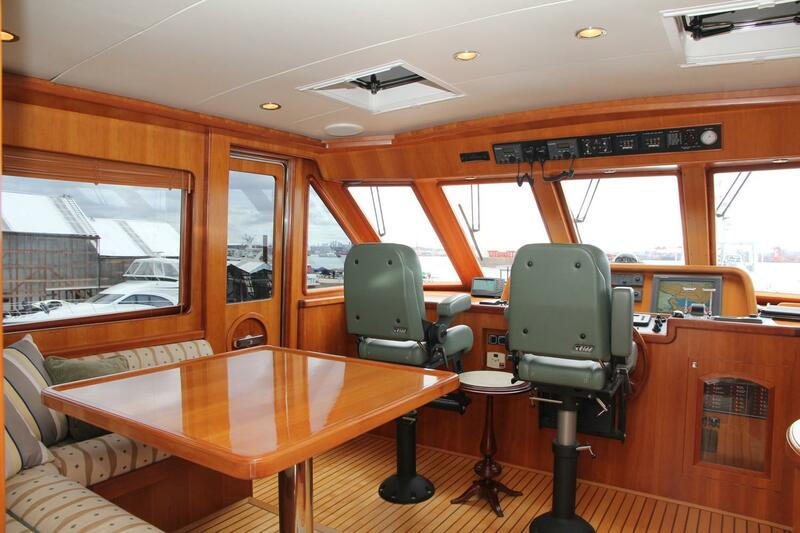 Outside on this deck is the walk-around upper Portuguese bridge with remote helm station. 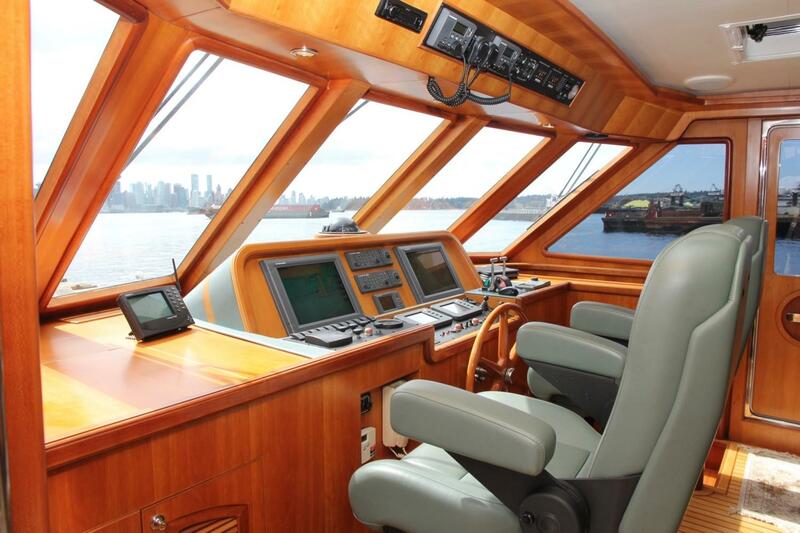 The helm is located in the skylounge and has all engine and navigation controls close at hand. 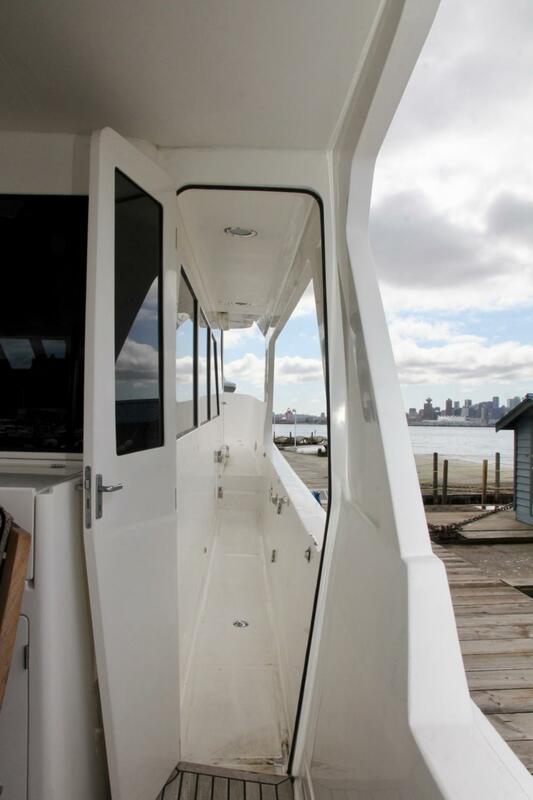 From the dock or a tender, board Folie Deux by the swim platform and transom. 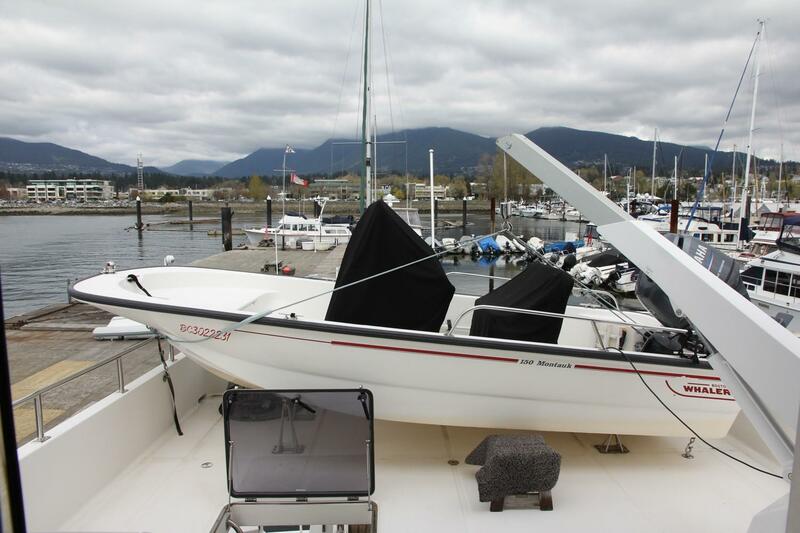 The swim platform is well proportioned, and has five removable staples making for easy and safe boarding. 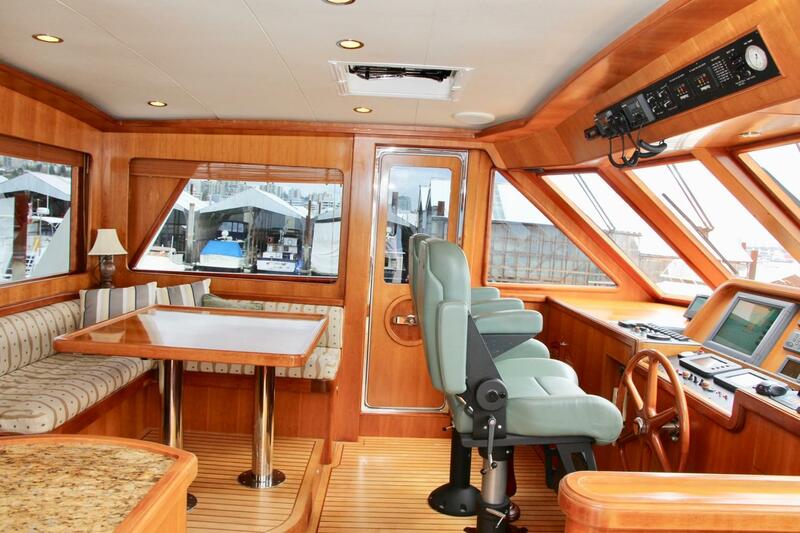 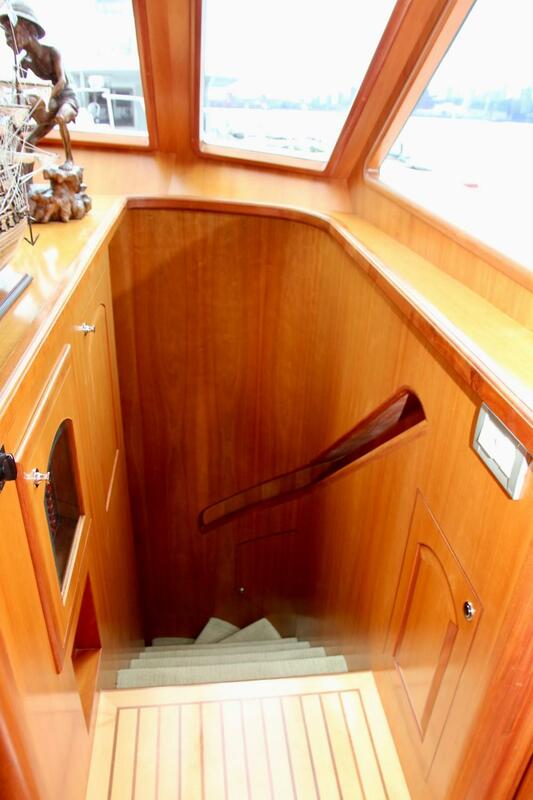 Stairs up to the teak clad aft deck with a built in settee and beautiful cherry wood table. 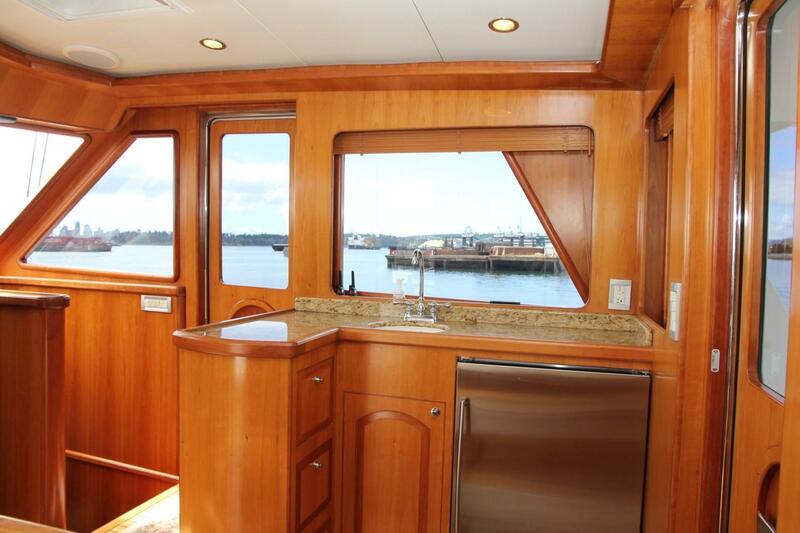 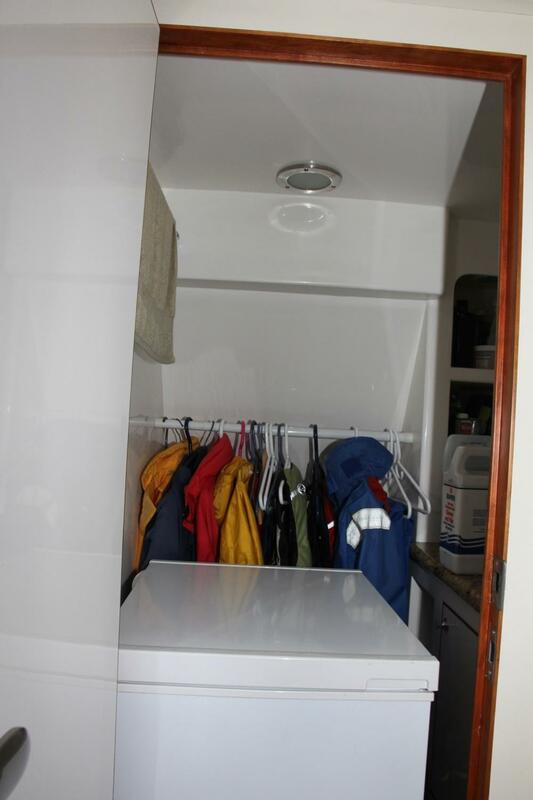 To port is a wet bar cabinet with U-Line refrigerator with ice maker, sink and storage. 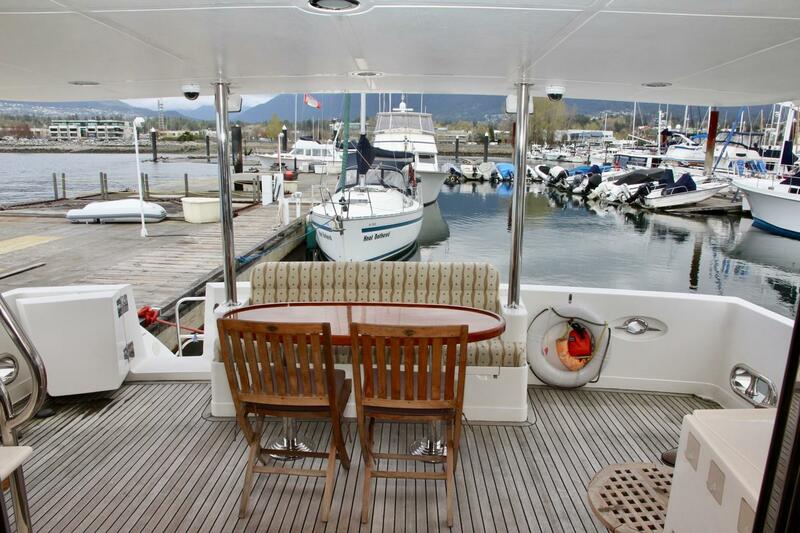 The aft deck is protected by an overhead hard top, being the extended boat deck above. 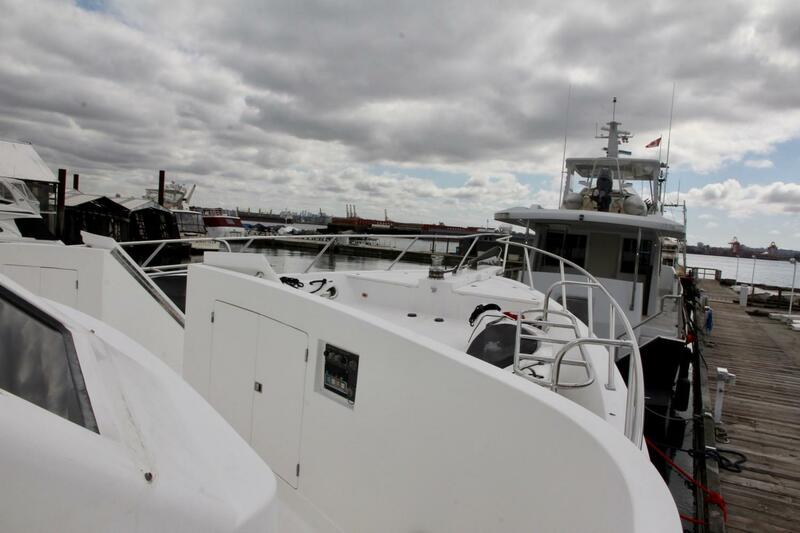 Crew protection continues forward along covered side decks. 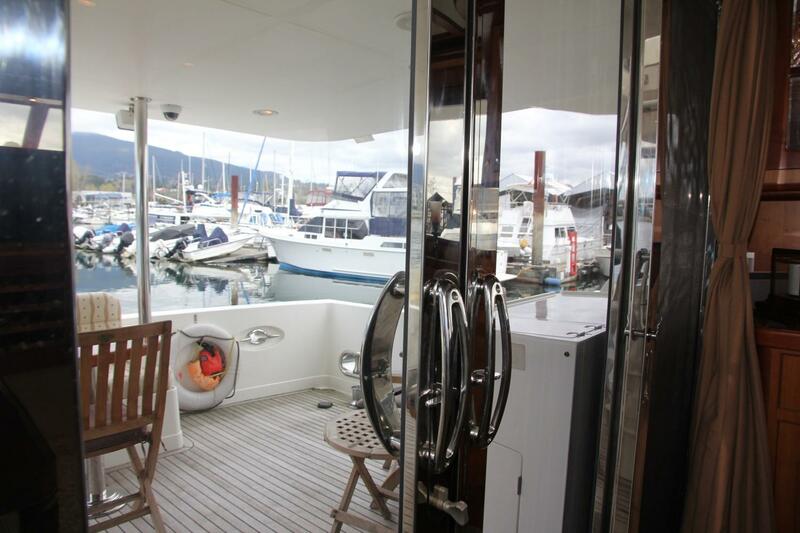 Access to the side decks through wing doors, protecting the aft deck from wind and weather. 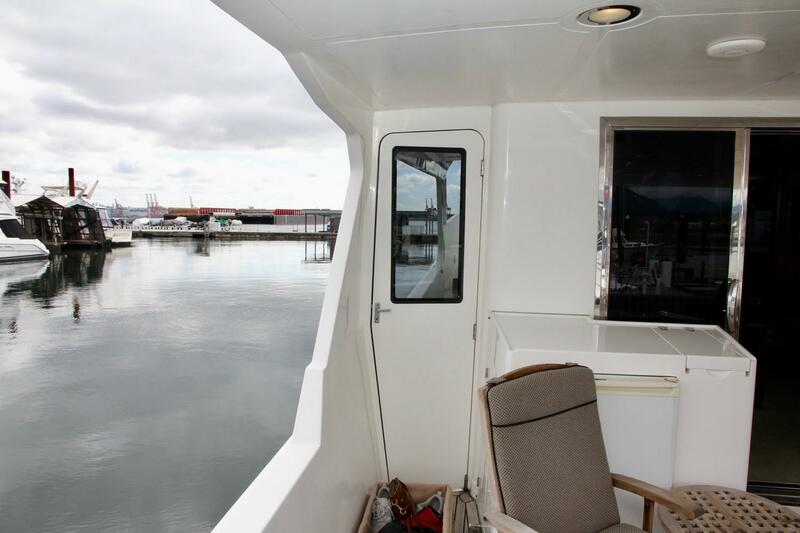 Midships along the side decks are port and starboard boarding gates. 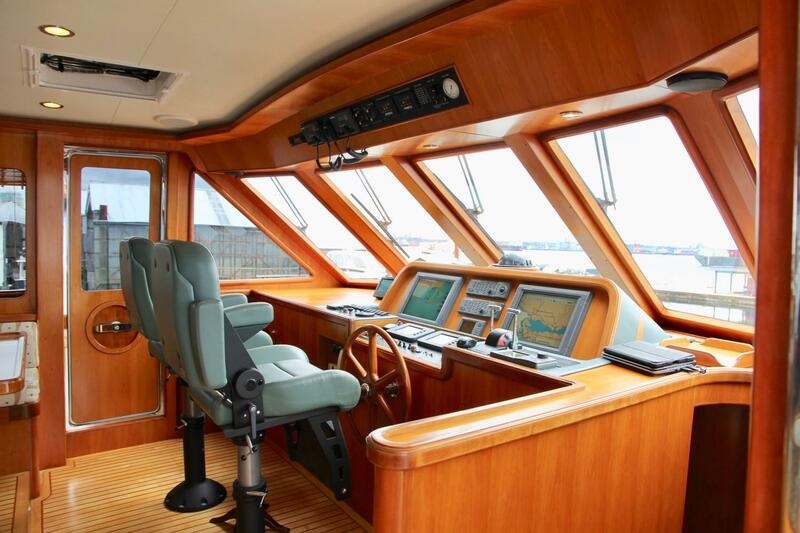 Cockpit helm station to starboard with steering, engine controls, engine start / stop, and thruster controls. 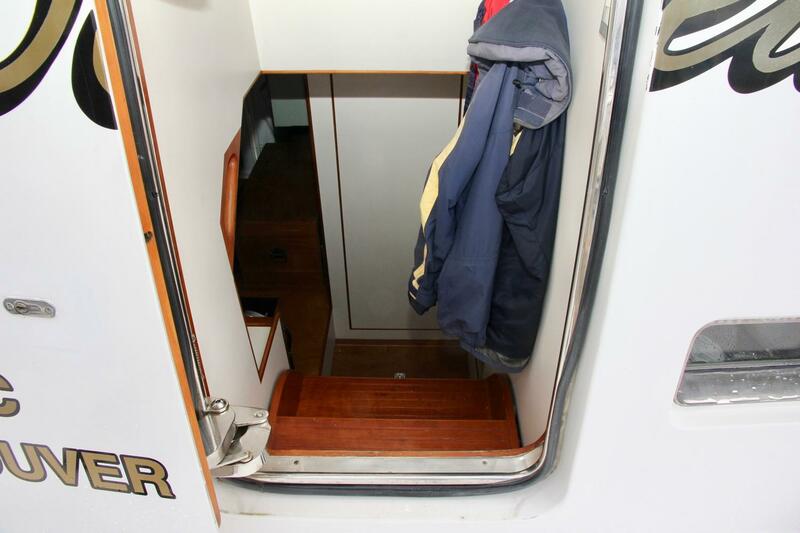 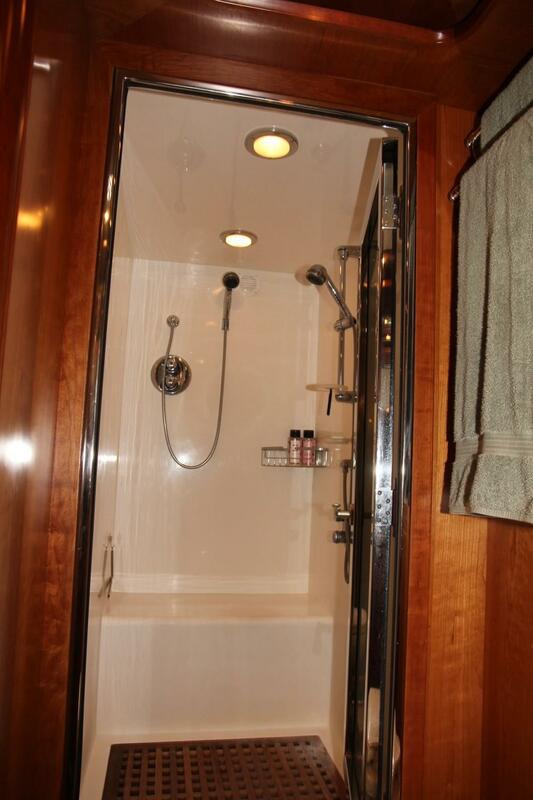 The transom also houses a watertight entry door to to the crew quarters, utility room, and engine room. 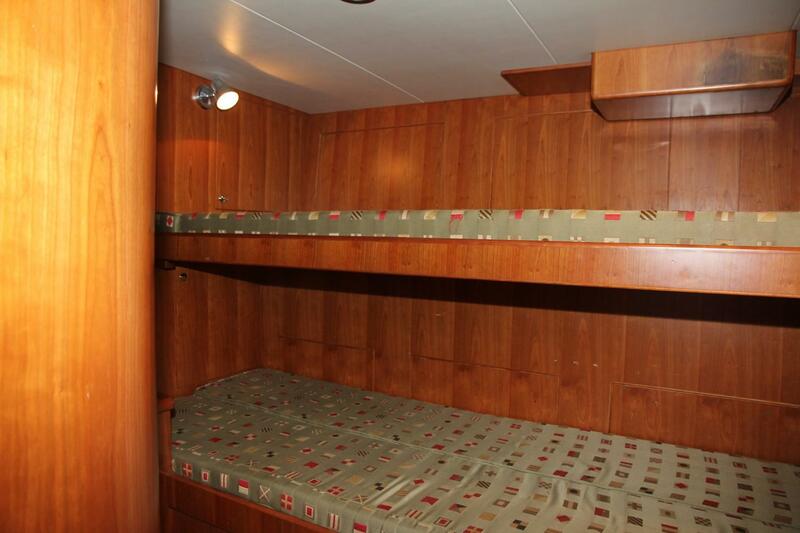 This area is also accessed via a hatch and stairwell from the aft deck. 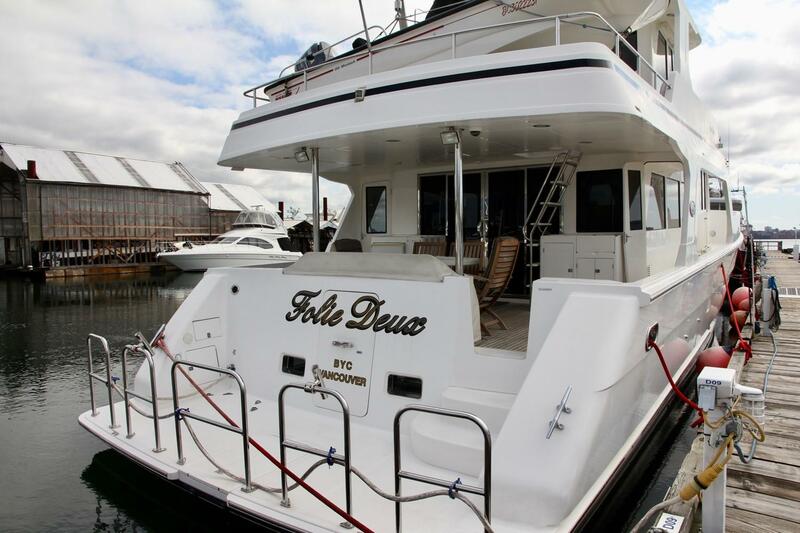 Folie Deux’s boat deck is accessed from the skylounge, or via a ladder from the aft deck. 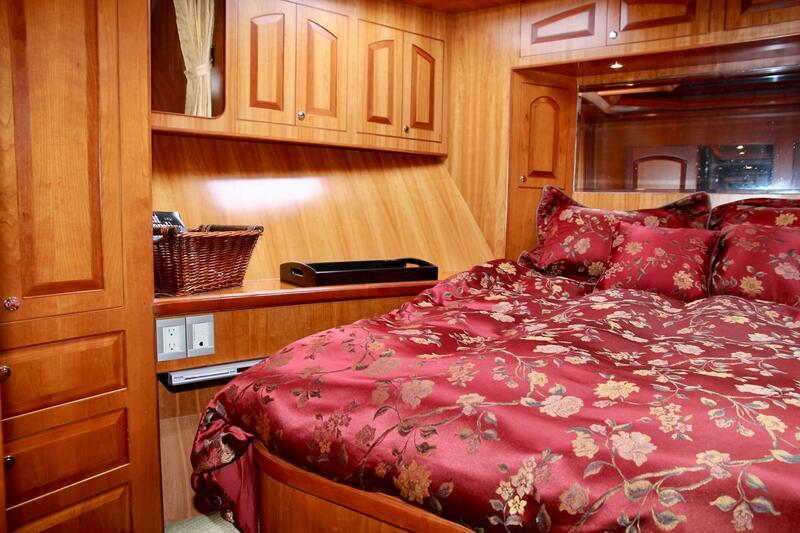 Here is ample room for the tender, and any other cruising gear such as kayaks and bikes, should you wish to add them. 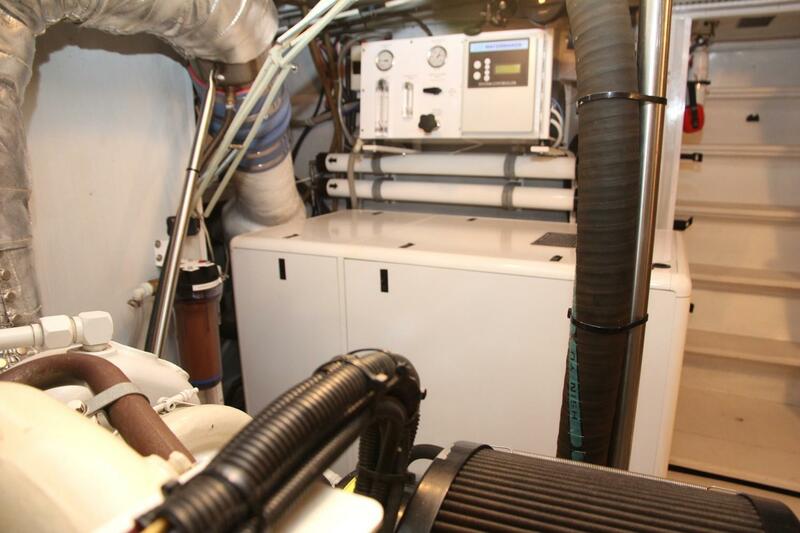 AC and DC power services the vessel through circuit breaker panels with appropriate voltage and ampere gauges. 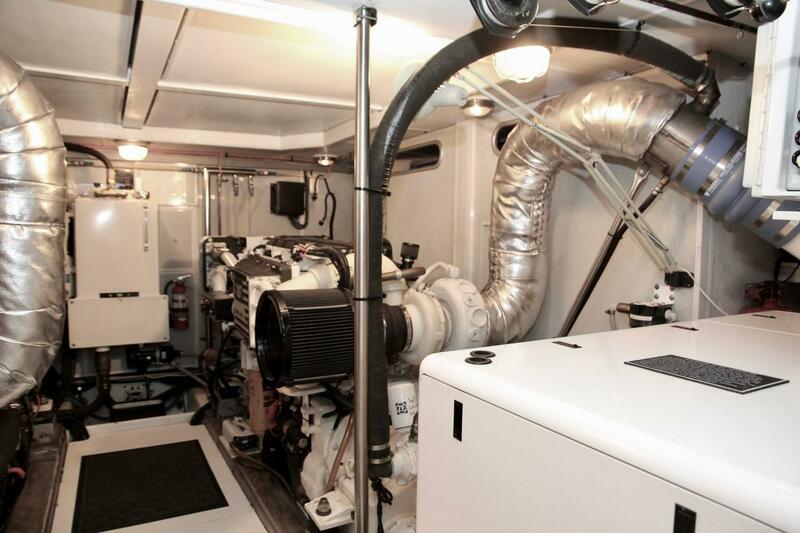 110VAC is provided by 50 Amp shore connection, by the genset, or, based on available house bank battery power, through the inverter. 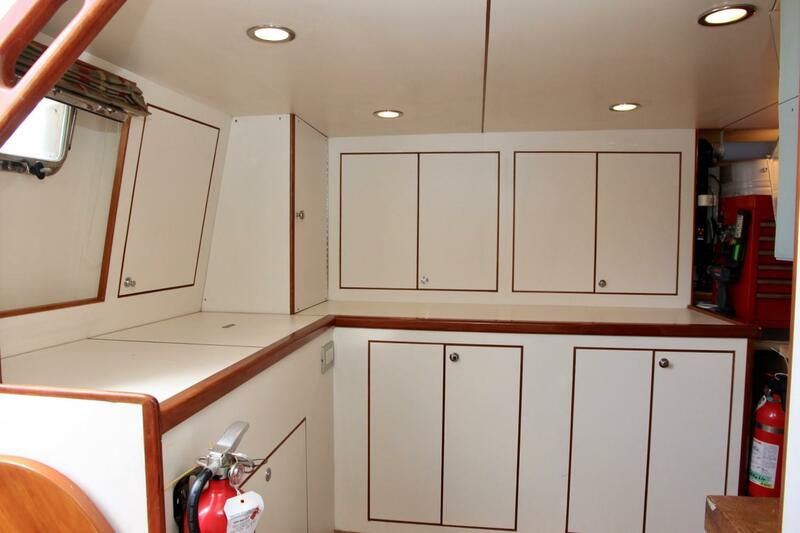 Enter the utility room and the engine room from a door on the swim platform or via a hatch and staircase from the cockpit. 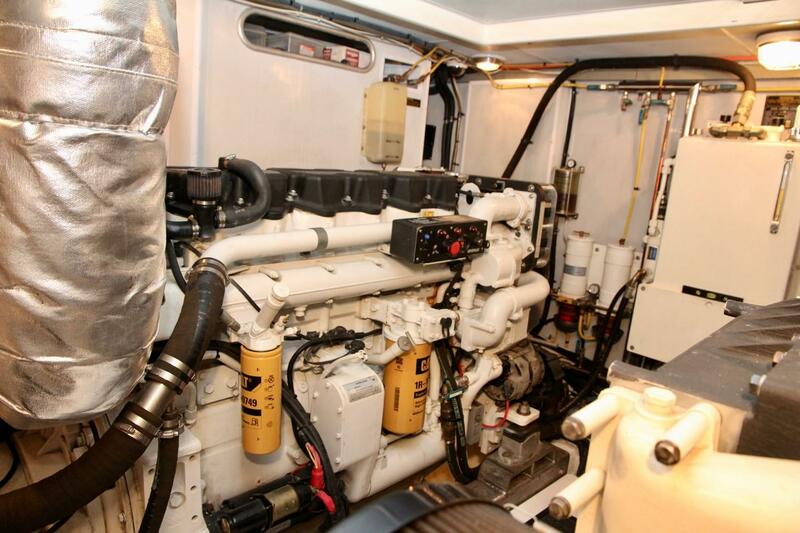 There is full standing head room in the machinery space for carrying out all maintenance and service needs. 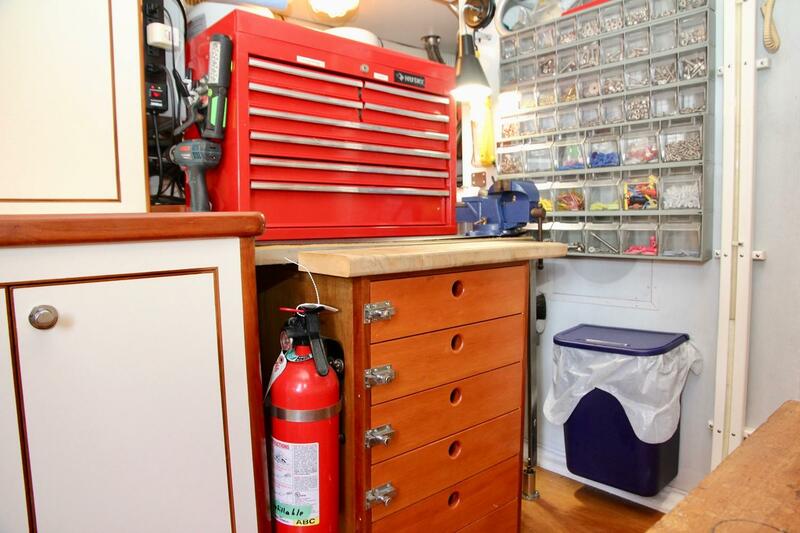 It is clean and well-organized making maintenance less a chore. 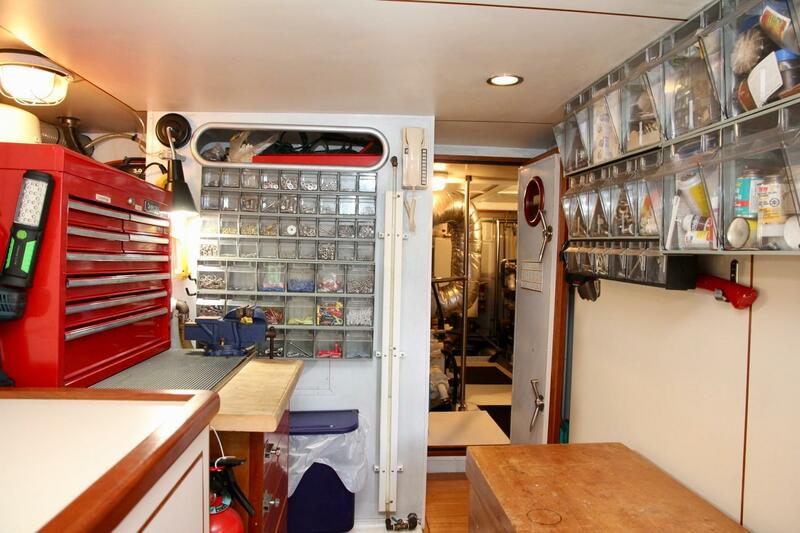 Owners personal effects, books, charts, art work and clock and barometer. 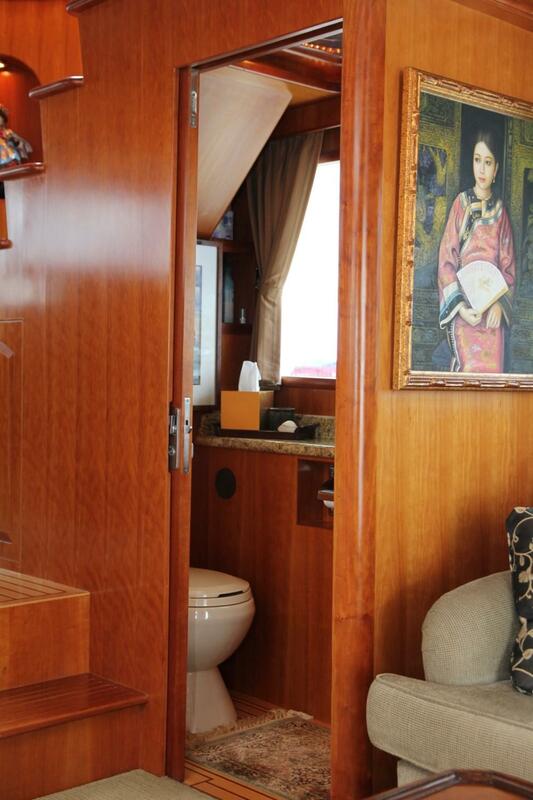 Hi there, I would like more information about the President Legend 700 Skylounge.